Launchpad couldn't import bug #432892 from Red Hat Bugzilla. down value) while the actual font size may be different on the new object. be cleared when flipping back and forth between text objects. Which version of Inkscape are you using? 2. Choose text tool, click on one if the texts. Click size box, ERASE everything and enter your own size. 3. Click in turn on the texts. It seems to me, it misbehaves when in "svg:text.style" property "font-family" is missing. Just verified with 0.45+0.46pre0-1 win32 available for download and the anticipated behaviour still does not seem to be there. 4. Select text1 - select text tool (F8) - the text size in the drop-down is still showing 18 though if you try and type more the size of 12 will actually be maintained. In short - the text size drop-down will always show the most recently selected test-size and not (as I believe would be sensible) the size of the currently selected text (if there is one naturally). Bulia just commited a bunch changes to the font drop-down menu code today, what SVN revision are you running? Or, if you don't know the SVN rev, then can you report where you downloaded Inkscape from, and on what day? I have just downloaded Inkscape0801272207.7z - which is the latest available Win32 binary (sorry, I am currently not able to build on my windows machine from SVN). The problem still seems to exists. Please have a look at the screenshot attached. The text size should be 72 and not 8 but the small text was the one I have created as last. I think, however, this seems to be a Windows issue as I recall I tried it on my linux machine and it worked OK (Can confirm this afternoon). I have downloaded source from SVN and built it on my Windows machine and I think I know why this problem occurs. seems to indicate the problem we see. If I change the font (Shitf+Ctrl+T) and its size then the Text toolbar (F8) shows both the font and size correctly. This brings another problem - I am unable to change the font (family, not size) of a default text using the toolbar (F8). Therefore I think the really is a manifestation of another bug. Can't reproduce on xp sp2 Inkscape0801301416.7z 30-Jan-2008, looks fixed to me. ** (inkscape:11288): WARNING **: Family name NotARealFontName does not have an entry in the font lister. I also confirm that I can't change the font using the picker in the toolbar in the SVG I just attached. High importance, since that's what Bryce gave to a dupe that I just merged in. Attaching an ogg screencast of the issue. 2.) In some cases drop down font selection menu doesn't disappear when font is selected, user has to press Enter. tool using F8 -- does the warning icon appear next to the font name picker? Pressing F8 the warning icon *does* appear. inkscape-0.45.1+0.46pre1-5.fc8. Could you please retest once it builds? that Fixed font cannot be used though it is present in the menu. .46 windows Font drop down doesnt work at all for choosing fonts. It does work after the font is changed from a default on to an existing one (via Ctrl+T). Just tested this today on Win and Linux with most recent SVN version where default font is set to one, that does not exist in the system (Sans in Windows and Bitstream Vera Sans under Linux). The behaviour is precisely as described in the initial bug report. Sorry, one small update - in Linux, once the font has been changed via Ctrl+T it is properly shown in the dropdown but the list still can't be used for changing the font. If the text object is selected the dropdown allows other fonts to be selected (though selected a different item does not have any effects - ie. the font does not change) but when the text itself is selected (highlighted) then no other font can be selected in the list. 1. SVG isn't littered now. 1. Font drop-down doesn't work at all. 2. Size drop-down is corrupted and doesn't reflect real text size. Confirming above. 0.46 Windows XP SP2. Font drop down not working. Can resize, but I don't have enough technical/design experience to confirm if size is correct. 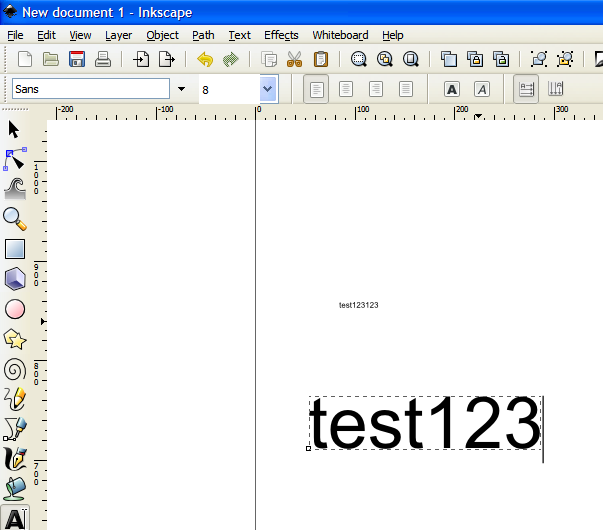 The font picker also does not work with V0.46 running on Windows 2000 Pro. However, a font size change made from the text control bar does remain in effect. The only way I can change fonts is to use the Text and Font dialog box. Confirmed for 0.46 WinXP SP3. Bug confirmed in 0.46 on Vista HP. Note also, that I've tried to type the font name directly in the toolbar, and when I pressed Enter, a warning icon appeared on the toolbar with a message (in Polish; sorry - I don't know where to look for the translation scripts - probably you know better) stating: "Ta czcionka nie jest aktualnie zainstalowana w systemie. Inkscape będzie używał zamiast niej czcionkę domyślną." - if translated to English, this message means: "This font is not currently installed on your system. Inkscape will use the default font instead." "It does work after the font is changed from a default on to an existing one (via Ctrl+T)." What is your opinion about the patch ? Upstream is currently reworking the font picker, unfortunately it probably won't be done until f11. The strange behaviour is generally observed when attempting to pick a bitmap font, which won't be of much use anyway. re patch for debian: thanks but your patch fixes a wrong problem - it is not inkscape's business to decide which font to use when bitstream vera is not available, it is pango who substitutes the virtual "sans" for it, and that choice is good enough; the only problem is that inkscape then fails to change from that virtual font to any real one, and i just fixed that. Many thanks for the notice! I forwarded it the the Debian maintainer of Inkscape. Closing because fix seems to work.